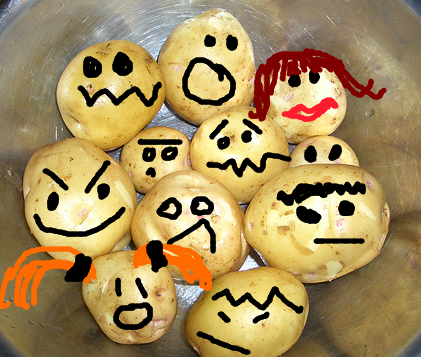 In language school, I learned one word for "potato" in Japanese: ジャガイモ (jagaimo). Turns out, real life isn't as simple as language school would have you believe. In Japanese supermarkets, I've rarely seen the vegetable actually labeled with the word I learned as a student, and the varieties popular in Japan look just different enough from the ones I'm used to at home that at first I had to ask someone in the shop: "Do you have any... ジャガイモ?" So, what are potatoes called in supermarkets? What varieties are popular here? And what are the differences between them? Read on to find out! I imagine this situation to be akin to an ESL learner proudly knowing the word "apple" only to walk into a shop and find labels like "Granny Smith" and "Red Delicious." They both look like apples, but what's the difference between them? Well, if you pick up something that looks like a potato, your curry dinner will probably turn out all right. But, the two most popular varieties of potatoes sold in Japan have different properties that suits each of them to different dishes. Those varieties are called だんしゃくいも (男爵芋, danshakuimo) and メークイン (meekuin). Abroad, they're known as "Irish Cobbler" and "May Queen," respectively. だんしゃく(いも) are the little round potatoes that usually come in bags of 7 or 8. They're the most common variety in Japan, and if your supermarket only sells one, it's probably this. 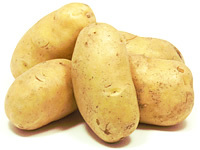 These potatoes are considered best suited for dishes like potato salad or mashed potatoes. They have an earthy smell and a rustic, potato-ey taste, especially right after harvest. (When you make curry with fresh だんしゃく, it smells heavily of potatoes.) They're popular with farmers because they mature quickly and can be stored for long periods with little degradation in quality. On the other hand, they're tiny things and a pain to use if your dish requires peeled potatoes. Once peeled, they must be used quickly or they discolor. Also, when they sprout, the sprouts run deep inside the potato, making them harder to remove. メークイン potatoes, on the other hand, are a larger, egg-shaped variety that may look more familiar to readers. Because of their larger size, they're often sold in packs of 3 or 4. These potatoes don't break up as easily as だんしゃく when they're boiled, and thus they're considered better for curries and stews. They have a sweet taste, and their larger size makes them easier to peel. Sprouts are also very shallow and easy to remove. Storing them increases their sweetness, but they spoil, especially if exposed to direct sunlight, more quickly than だんしゃく. By the way, another label you are very likely to encounter in the supermarket is ばれいしょ (bareisho), usually in hiragana, but it also has kanji: 馬鈴薯. This word is not a variety of potato: It's just another word for potato coming from the dialect of Hokkaido. It's kind of like saying "spud" in US English. 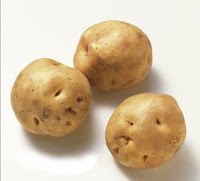 Because だんしゃく are often the only variety of potato sold at a small shop (under a sign reading ばれいしょ), it's easy to mistake this word as a variety name for those little round guys. Finally, although we've introduced the two most popular varieties of potatoes here, they aren't the only types sold in Japan. If you're interested in learning more, here's a list of other potato varieties in Japan. The site is in Japanese only, but its data is arranged in handy columns, including characteristics or cooking suggestions for each type on the right.